Nanomaterials | Genesis Nanotechnology, Inc.
OAK RIDGE, Tenn., March 16, 2016 — Researchers at theDepartment of Energy’s Oak Ridge National Laboratory have combined advanced in-situ microscopy and theoretical calculations to uncover important clues to the properties of a promising next-generation energy storage material for supercapacitors and batteries. ORNL’s Fluid Interface Reactions, Structures and Transport (FIRST) research team, using scanning probe microscopy made available through the Center for Nanophase Materials Sciences (CNMS) user program, have observed for the first time at the nanoscale and in a liquid environment how ions move and diffuse between layers of a two-dimensional electrode during electrochemical cycling. This migration is critical to understanding how energy is stored in the material, called MXene, and what drives its exceptional energy storage properties. “We have developed a technique for liquid environments that allows us to track how ions enter the interlayer spaces. There is very little information on how this actually happens,” said Nina Balke, one of a team of researchers working with Drexel University’s Yury Gogotsi in the FIRST Center, a DOE Office of Science Energy Frontier Research Center. “The energy storage properties have been characterized on a microscopic scale, but no one knows what happens in the active material on the nanoscale in terms of ion insertion and how this affects stresses and strains in the material,” Balke said. The so-called MXene material — which acts as a two-dimensional electrode that could be fabricated with the flexibility of a sheet of paper — is based on MAX-phase ceramics, which have been studied for decades. Chemical removal of the “A” layer leaves two-dimensional flakes composed of transition metal layers — the “M” — sandwiching carbon or nitrogen layers (the “X”) in the resulting MXene, which physically resembles graphite. These MXenes, which have exhibited very high capacitance, or ability to store electrical charge, have only recently been explored as an energy storage medium for advanced batteries. “The interaction and charge transfer of the ion and the MXene layers is very important for its performance as an energy storage medium. The adsorption processes drive interesting phenomena that govern the mechanisms we observed through scanning probe microscopy,” said FIRST researcher Jeremy Come. The researchers explored how the ions enter the material, how they move once inside the materials and how they interact with the active material. For example, if cations, which are positively charged, are introduced into the negatively charged MXene material, the material contracts, becoming stiffer. That observation laid the groundwork for the scanning probe microscopy-based nanoscale characterization. The researchers measured the local changes in stiffness when ions enter the material. There is a direct correlation with the diffusion pattern of ions and the stiffness of the material. Come noted that the ions are inserted into the electrode in a solution. “Therefore, we need to work in liquid environment to drive the ions within the MXene material. Then we can measure the mechanical properties in-situ at different stages of charge storage, which gives us direct insight about where the ions are stored,” he said. Until this study the technique had not been done in a liquid environment. The processes behind ion insertion and the ionic interactions in the electrode material had been out of reach at the nanoscale until the CNMS scanning probe microscopy group’s studies. The experiments underscore the need for in-situ analysis to understand the nanoscale elastic changes in the 2D material in both dry and wet environments and the effect of ion storage on the energy storage material over time. The researchers’ next steps are to improve the ionic diffusion paths in the material and explore different materials from the MXene family. Ultimately, the team hopes to understand the process’s fundamental mechanism and mechanical properties, which would allow tuning the energy storage as well as improving the material’s performance and lifetime. ORNL’s FIRST research team also provided additional calculations and simulations based on density functional theory that support the experimental findings. The work was recently published in the Journal Advanced Energy Materials. The research team in addition to Balke and Come and Drexel’s Gogotsi included Michael Naguib, Stephen Jesse, Sergei V. Kalinin, Paul R.C. Kent and Yu Xie, all of ORNL. The FIRST Center is an Energy Frontier Research Center supported by the DOE Office of Science (Basic Energy Sciences). The Center for Nanophase Materials Sciences and the National Energy Research Scientific Computing Center are DOE Office of Science User Facilities. UT-Battelle manages ORNL for the DOE’s Office of Science. The Office of Science is the single largest supporter of basic research in the physical sciences in the United States, and is working to address some of the most pressing challenges of our time. For more information, please visit http://science.energy.gov/. Image cutline: When a negative bias is applied to a two-dimensional MXene electrode, Li+ ions from the electrolyte migrate in the material via specific channels to the reaction sites, where the electron transfer occurs. 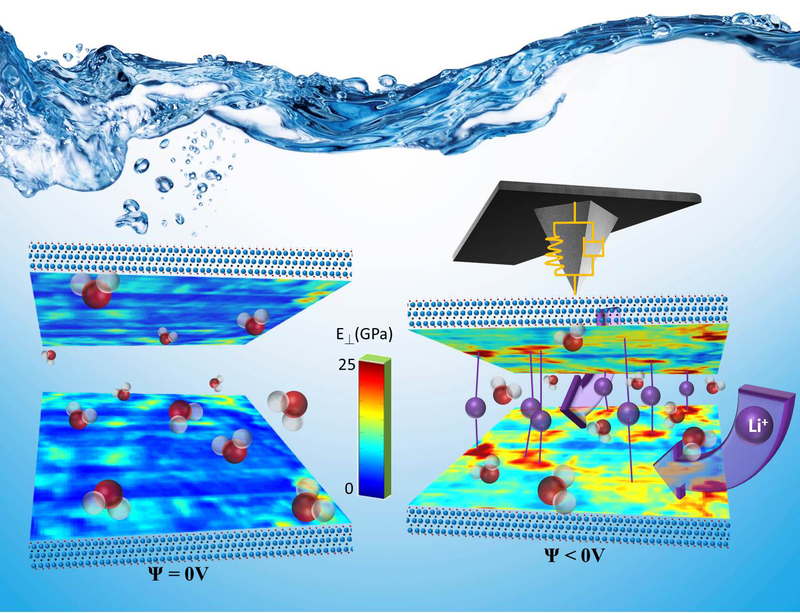 Scanning probe microscopy at Oak Ridge National Laboratory has provided the first nanoscale, liquid environment analysis of this energy storage material. Jason looks at how Quantum Dot technology has progressed, initially as a research topic and then as a commercial product. He defines what commercial success looks like and outlines future market opportunities for the further success of Quantum Dots. Topics include: Quantum Dot business models, architectures and long term roadmap, regulatory environment and future market opportunities. Hydrogen-fuel-cell vehicles haven’t yet made major in-roads in vehicle sales, though several major auto manufacturers including Toyota, Honda, and General Motors, have invested in developing hydrogen fuel-cell vehicles. Indeed, Toyota released a small-production model called the Mirai, which uses compressed-hydrogen tanks, last year in the U.S.
More R&D is needed to realize higher-capacity hydrogen storage for long-range vehicle applications that exceed the performance of existing electric-vehicle batteries, Cho said, and other applications may be better suited for hydrogen fuel cells in the short term, such as stationary power sources, forklifts and airport vehicles, portable power sources like laptop battery chargers, portable lighting, water and sewage pumps and emergency services equipment. Cho said that a roadblock to metal hydride storage has been a relatively slow rate in taking in (absorption) and giving out (desorption) hydrogen during the cycling of the units. In fuel cells, separate chemical reactions involving hydrogen and oxygen produce a flow of electrons that are channeled as electric current, creating water as a byproduct. The tiny size of the graphene-encapsulated nanocrystals created at Berkeley Lab, which measure only about 3-4 nanometers, or billionths of a meter across, is a key in the new fuel cell materials’ fast capture and release of hydrogen, Cho said, as they have more surface area available for reactions than the same material would at larger sizes. Another key is protecting the magnesium from exposure to air, which would render it unusable for the fuel cell, she added. “It is stable in air, which is important,” Cho said. Next steps in the research will focus on using different types of catalysts—which can improve the speed and efficiency of chemical reactions—to further improve the fuel cell’s conversion of electrical current, and in studying whether different types of material can also improve the fuel cell’s overall capacity, Cho said. Henkel Electronic Materials LLC is a division of global material supplier, Henkel Corporation. Headquartered in Irvine, California with sales, service, manufacturing and advanced R&D centers around the globe. Iowa State University engineers have developed a new flexible, stretchable and tunable “meta-skin” that uses rows of small, liquid-metal devices to cloak an object from the sharp eyes of radar. The meta-skin takes its name from metamaterials, which are composites that have properties not found in nature and that can manipulate electromagnetic waves. By stretching and flexing the polymer meta-skin, it can be tuned to reduce the reflection of a wide range of radar frequencies. The journal Scientific Reports recently reported the discovery online. Lead authors from Iowa State’s department of electrical and computer engineering are Liang Dong, associate professor; and Jiming Song, professor. Co-authors are Iowa State graduate students Siming Yang, Peng Liu and Qiugu Wang; and former Iowa State undergraduate Mingda Yang. The National Science Foundation and the China Scholarship Council have partially supported the project. “It is believed that the present meta-skin technology will find many applications in electromagnetic frequency tuning, shielding and scattering suppression,” the engineers wrote in their paper. Dong has a background in fabricating micro and nanoscale devices and working with liquids and polymers; Song has expertise in looking for new applications of electromagnetic waves. Working together, they were hoping to prove an idea: that electromagnetic waves – perhaps even the shorter wavelengths of visible light – can be suppressed with flexible, tunable liquid-metal technologies. What they came up with are rows of split ring resonators embedded inside layers of silicone sheets. The electric resonators are filled with galinstan, a metal alloy that’s liquid at room temperature and less toxic than other liquid metals such as mercury. Those resonators are small rings with an outer radius of 2.5 millimeters and a thickness of half a millimeter. They have a 1 millimeter gap, essentially creating a small, curved segment of liquid wire. The rings create electric inductors and the gaps create electric capacitors. Together they create a resonator that can trap and suppress radar waves at a certain frequency. Stretching the meta-skin changes the size of the liquid metal rings inside and changes the frequency the devices suppress. Tests showed radar suppression was about 75 percent in the frequency range of 8 to 10 gigahertz, according to the paper. When objects are wrapped in the meta-skin, the radar waves are suppressed in all incident directions and observation angles. “Therefore, this meta-skin technology is different from traditional stealth technologies that often only reduce the backscattering, i.e., the power reflected back to a probing radar,” the engineers wrote in their paper. As he discussed the technology, Song took a tablet computer and called up a picture of the B-2 stealth bomber. One day, he said, the meta-skin could coat the surface of the next generation of stealth aircraft. But the researchers are hoping for even more – a cloak of invisibility. Luminescent quantum dots (LQDs), which possess high photoluminescence quantum yields, flexible emission color controlling, and solution processibility, are promising for applications in lighting systems (warm white light without UV and infrared irradiation) and high quality displays. However, the commercialization of LQDs has been held back by the prohibitively high cost of their production. Currently, LQDs are prepared by the HI method, requiring at high temperature and tedious surface treating in order to improve both optical properties and stability. In a breakthrough approach, researchers have now succeeded in preparing highly emissive inorganic perovskite quantum dots (IPQDs) at room temperature. Zeng and his team have reported their findings in the February 29, 2016 online edition of Advanced Functional Materials (“CsPbX3 Quantum Dots for Lighting and Displays: Room-Temperature Synthesis, Photoluminescence Superiorities, Underlying Origins and White Light-Emitting Diodes”). The room temperature procedures developed by the researchers make scaled production possible so that gram-scale of quantum dots can be synthesized easily with very low cost and in short time. Already applied in the production of some organic nanoparticles, under the assist of surfactants, a supersaturated recrystallization (SR) process can be applied to fabricate QDs with well size and composition controls in solutions, especially when considering the ionic crystal features of halide perovskites. He points out that the operation of his team’s SR synthesis is very simple, and can be summarized as transferring various inorganic ions from their very good into very poor solvents. Although developed only recently, inorganic halide perovskite quantum dot systems have exhibited comparable and even better performances than traditional QDs in many fields. With this novel room-temperature preparation technique, IPQDs’ superior optical merits could lead to promising applications in lighting and displays. “Though more investigations are needed to reveal the correlations between structural – especially the surface states – and physical properties, our findings will provide good references and enhance researchers’ understanding of this quantum dot system, pushing it to a new research paradigm in the field of optoelectronic devices, as well as sensors and memristors,” concludes Zeng. Nanoparticles – tiny particles 100,000 times smaller than the width of a strand of hair – can be found in everything from drug delivery formulations to pollution controls on cars to HD TV sets. With special properties derived from their tiny size and subsequently increased surface area, they’re critical to industry and scientific research. They’re also expensive and tricky to make. Now, researchers at USC have created a new way to manufacture nanoparticles that will transform the process from a painstaking, batch-by-batch drudgery into a large-scale, automated assembly line. The method, developed by a team led by Noah Malmstadt of the USC Viterbi School of Engineering and Richard Brutchey of the USC Dornsife College of Letters, Arts and Sciences, was published in Nature Communications on Feb. 23. Consider, for example, gold nanoparticles. They have been shown to be able to easily penetrate cell membranes without causing any damage – an unusual feat, given that most penetrations of cell membranes by foreign objects can damage or kill the cell. Their ability to slip through the cell’s membrane makes gold nanoparticles ideal delivery devices for medications to healthy cells, or fatal doses of radiation to cancer cells. However, a single milligram of gold nanoparticles currently costs about $80 (depending on the size of the nanoparticles). That places the price of gold nanoparticles at $80,000 per gram – while a gram of pure, raw gold goes for about $50. Right now, the process of manufacturing a nanoparticle typically involves a technician in a chemistry lab mixing up a batch of chemicals by hand in traditional lab flasks and beakers. Brutchey and Malmstadt’s new technique instead relies on microfluidics – technology that manipulates tiny droplets of fluid in narrow channels. “In order to go large scale, we have to go small,” Brutchey said. Really small. The team 3D printed tubes about 250 micrometers in diameter – which they believe to be the smallest, fully enclosed 3D printed tubes anywhere. For reference, your average-sized speck of dust is 50 micrometers wide. They then built a parallel network of four of these tubes, side-by-side, and ran a combination of two non-mixing fluids (like oil and water) through them. As the two fluids fought to get out through the openings, they squeezed off tiny droplets. Each of these droplets acted as a micro-scale chemical reactor in which materials were mixed and nanoparticles were generated. Each microfluidic tube can create millions of identical droplets that perform the same reaction. This sort of system has been envisioned in the past, but its hasn’t been able to be scaled up because the parallel structure meant that if one tube got jammed, it would cause a ripple effect of changing pressures along its neighbors, knocking out the entire system. Think of it like losing a single Christmas light in one of the old-style strands – lose one, and you lose them all. Brutchey and Malmstadt bypassed this problem by altering the geometry of the tubes themselves, shaping the junction between the tubes such that the particles come out a uniform size and the system is immune to pressure changes. Malmstadt and Brutchy collaborated with Malancha Gupta of USC Viterbi and USC graduate students Carson Riche and Emily Roberts. Just as the single-crystal silicon wafer forever changed the nature of communication 60 years ago, a group of Cornell researchers is hoping its work with quantum dot solids – crystals made out of crystals – can help usher in a new era in electronics. The team, led by Tobias Hanrath, associate professor in the Robert Frederick Smith School of Chemical and Biomolecular Engineering, and graduate student Kevin Whitham, has fashioned two-dimensional superstructures out of single-crystal building blocks. Through a pair of chemical processes, the lead-selenium nanocrystals are synthesized into larger crystals, then fused together to form atomically coherent square superlattices. The difference between these and previous crystalline structures is the atomic coherence of each 5-nanometer crystal (a nanometer is one-billionth of a meter). They’re not connected by a substance between each crystal – they’re connected to each other. The electrical properties of these superstructures potentially are superior to existing semiconductor nanocrystals, with anticipated applications in energy absorption and light emission. 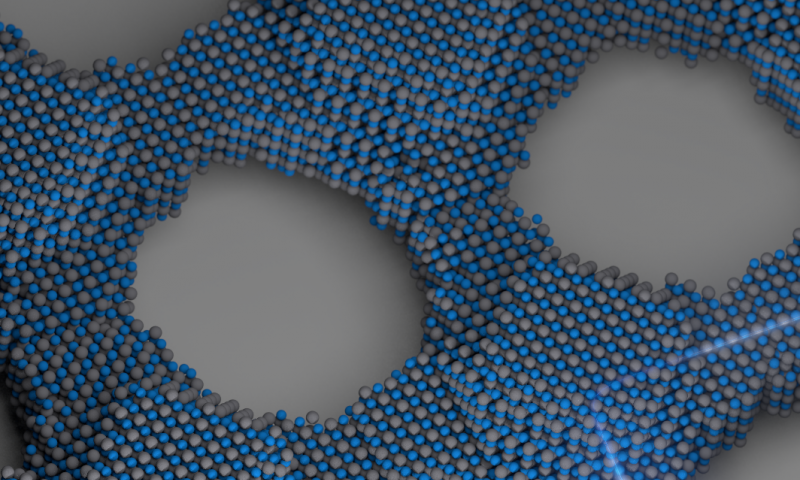 The Hanrath group’s paper, “Charge transport and localization in atomically coherent quantum dot solids,” is published in this month’s issue of Nature Materials. That barrier seems to have been cleared with this new research. The strong coupling of the nanocrystals leads to formation of energy bands that can be manipulated based on the crystals’ makeup, and could be the first step toward discovering and developing other artificial materials with controllable electronic structure. Still, Whitham said, more work must be done to bring the group’s work from the lab to society. The structure of the Hanrath group’s superlattice, while superior to ligand-connected nanocrystal solids, still has multiple sources of disorder due to the fact that all nanocrystals are not identical. This creates defects, which limit electron wave function. Nebraska Researcher Find Gold “There’s Gold in them-thare (hills) … rather Nano-Sensors”! Instead of a pan and a pick ax, prospectors of the future might seek gold with a hand-held biosensor that uses a component of DNA to detect traces of the element in water. The gold sensor is the latest in a series of metal-detecting biosensors under development by Rebecca Lai, an associate professor of chemistry at the University of Nebraska-Lincoln. Other sensors at various stages of development detect mercury, silver or platinum. Similar technology could be used to find cadmium, lead, arsenic, or other metals and metalloids. A primary purpose for the sensors would be to detect water contaminants, Lai said. She cited the August 2015 blowout of a gold mine near Silverton, Colorado, which spilled chemicals into nearby rivers, as well as the ongoing problems with lead-tainted water supplies in Flint, Michigan. Fabricated on paper strips about the size of a litmus strip, Lai’s sensors are designed to be inexpensive, portable and reusable. Instead of sending water samples away for time-consuming tests, people might someday use the biosensors to routinely monitor household water supplies for lead, mercury, arsenic or other dangerous contaminants. But Lai also is among scientists searching for new and better ways to find gold. Not only aesthetically appealing and financially valuable, the precious metal is in growing demand for pharmaceutical and scientific purposes, including anti-cancer agents and drugs fighting tuberculosis and rheumatoid arthritis. Scientists have employed several strategies to find gold, such as fluorescence-based sensors, nanomaterials and even a whole cell biosensor that uses transgenic E. coli. Lai was a co-author of a 2013 study that explored the use of E. coli as a gold biosensor. DNA, the carrier of genetic information in nearly all living organisms, might seem an unlikely method to detect gold and other metals. Lai’s research, however, exploits long-observed interactions between metal ions and the four basic building blocks of DNA: adenine, cytosine, guanine and thymine. Different metal ions have affinities with the different DNA bases. The gold sensor, for example, is based on gold ions’ interactions with adenine. A mercury sensor is based upon mercury ions’ interaction with thymine. A silver sensor would be based upon silver ions’ interaction with cytosine. NUtech Ventures, UNL’s affiliate for technology commercialization, is pursuing patent protection and seeking licensing partners for Lai’s metal ion sensors. She applied for a patent for the sensors in 2014. “Although these interactions have been well-studied, they have not been exploited for use in electrochemical metal ion sensing,” Lai and doctoral student Yao Wu said in a recent Analytical Chemistry article describing the gold sensor. Lai and Wu say their article is the first report of how oligoadenines — short adenine chains — can be used in the design and fabrication of this class of electrochemical biosensors, which would be able to measure concentrations of a target metal in a water sample as well as its presence. The DNA-based sensor detects Au(III), a gold ion that originates from the dissolution of metallic gold. The mercury and silver sensors also detect dissolved mercury and silver ions. “The detected Au(III) has to come from metallic gold, so if gold is found in a water supply, a gold deposit is somewhere nearby,” Lai explained. The DNA-based biosensors need more refinement before they can be made commercially available, she said. Lai’s sensor works by measuring electric current passing from an electrode to a tracer molecule, methylene blue in this case. In the absence of Au(III), the observed current is high because the oligoadenine probes are highly flexible and the electron transfer between the electrode and the tracer molecule is efficient. But upon binding to Au(III) in the sample, the flexibility of the oligoadenine DNA probes is hindered, resulting in a large reduction in the current from the tracer molecule. The extent of the change in current is used to determine the concentration of AU(III) in the sample. To allow the sensor to be reused multiple times, the Au(III) is later removed from the sensor with an application of another ligand. Lai’s research focus is on electrochemical ion sensors. Her research has been supported with grants from the National Institutes of Health and the National Science Foundation. Graphene is a single-atomic carbon sheet with a hexagonal honeycomb network. Electrons in graphene take a special electronic state called Dirac-cone where they behave as if they have no mass. This allows them to flow at very high speed, giving graphene a very high level of electrical conductivity. This is significant because electrons with no mass flowing with no resistance in graphene could lead to the realization of an ultimately high-speed nano electronic device. The collaborative team of Tohoku University and the University of Tokyo has developed a method to grow high-quality graphene on a silicon carbide (SiC) crystal by controlling the number of graphene sheets. The team fabricated bilayer graphene with this method and then inserted calcium (Ca) atoms between the two graphene layers like a sandwich. They measured the electrical conductivity with the micro four-point probe method and found that the electrical resistivity rapidly drops at around 4 K (-269 °C), indicative of an emergence of superconductivity. The team also found that neither genuine bilayer graphene nor lithium-intercalated bilayer graphene shows superconductivity, indicating that the superconductivity is driven by the electron transfer from Ca atoms to graphene sheets. The success in fabricating superconducting graphene is expected to greatly impact both the basic and applied researches of graphene. It is currently not clear what phenomenon takes place when the Dirac electrons with no mass become superconductive with no resistance. But based on the latest study results, further experimental and theoretical investigations would help to unravel the properties of superconducting graphene. The superconducting transition temperature (Tc) observed in this study on Ca-intercalated bilayer graphene is still low (4 K). This prompts further studies into ways to increase Tc, for example, by replacing Ca with other metals and alloys, or changing the number of graphene sheets. From the application point of view, the latest results pave the way for the further development of ultrahigh-speed superconducting nano devices such as a quantum computing device, which utilizes superconducting graphene in its integrated circuit. The above post is reprinted from materials provided by Tohoku University. Note: Materials may be edited for content and length.